Zork lives on the Altair! And what better platform to do so than the Altair? Just like MS-DOS right?. … Not quite. Anyways there is time to tour later, but for now there is dungeons to explore. changing drives is just like MS-DOS, letter, colon then hit enter. Ok now lets copy in the zork game from the native PC into the emulator. Hat’s off to Peter Schorn for this! Read from “ZORK1.COM” and write to “ZORK1.COM”. PTR: unit is read only8.5kB written. Read from “ZORK1.DAT” and write to “ZORK1.DAT”. PTR: unit is read only83kB written. Ok, now with that out of the way, lets enter the Dungeon! Copyright (c) 1981, 1982, 1983 Infocom, Inc. All rightsreserved. Opening the small mailbox reveals a leaflet. Ok, now we are playing one of the greatest games ever. Wikipedia has an awesome article on Zork ( http://en.wikipedia.org/wiki/Zork ) And along with ( http://infocom.elsewhere.org/gallery/zork1/zork1.html ) You can party like its 1982. Author neozeedPosted on May 15, 2007 Categories Altairz80, CP/M, Infocom, SIMH, Zork1 Comment on Zork lives on the Altair! The ammount of systems that this package contains is simply amazing. It could probably take me a few months to properly review the whole thing, but to get started, I’m going to go with building from source code. As it ships it’s really meant for UNIX type build enviroments with CLI tools. Now if you really want you can build it from the main site using MinGW (http://www.mingw.org/download.shtml). I’ve built simh using Microsoft Visual C++ 2005 Express. You can download that here (http://msdn.microsoft.com/vstudio/express/visualc/default.aspx). You’ll also need to install the Platform and integrate it with VC++. Instructions on how to do that can be found here (http://msdn.microsoft.com/vstudio/express/visualc/usingpsdk/ ). If you are on Vista, be sure to install the service packs associated with the Express tools! With that out of the way, simply download the project file from my site (http://sourceforge.net/projects/simh/files/simh%20source%20code/simh%203.7-3/simh-3.73-vc2005.zip/download), unzip it, and open simh-3.71.sln . I’ve included the runtime for WinPCAP, so this *should* build on your computer. Unless you want to really dive into the source, you can build the release target, and then build the entire solution. On my laptop this takes about 3-5 minutes. Remember that if you want to run your 2005 compiled EXE’s on another computer will need to install the associated runtime on that machine first. Once it’s completed, just open the release folder, and you’ll see all the emulated systems. With the -network part to signify that they are capable of networking. You will need to have WinPCAP 4.0 installed on your computer to take advantage of it, however the host computer is unable to communicate with the emulated computer. Author neozeedPosted on May 15, 2007 June 28, 2011 Categories SIMH, VisualC++ 2005 ExpressLeave a comment on SIMH 3.71 released! I was thinking with some of the larger files on my poor webserver it’d get slamed with too many people on it. Then I noticed that uTorrent supprots a limited tracker server, so I put two and two together, and decided to give it a shot. I setup a RSS feed of the current torrents here: http://www.vaxenrule.com/vaxenrule.xml . You can subscribe to it, and that way you’ll get the ‘newest’ of the old. Also it’ll allow me to have a few machines at work in various locations througout the world to share the load as it were. As of this moment, I’m sharing SLS 1.05 & Lites/Mach UK22. I figure something old & something obscure is a good start. Ok, I thought I’d kick this thing off, by installing the most popular NOS (network operating systems) on Qemu. First I tried the 2.x stuff, and it just crashes on the bootup of the kernel. Which is frustrating, as it required me to shuffle floppies like there was simply no tomorrow. I also have a copy of 4.1, which I’ll do at some other time. MS-DOS, or I suppose you can you any DOS compatible OS. I haven’t tried DR-DOS, or FreeDOS. For this installation I’m going to be using MS-DOS 6.22 that is available on MSDN. Here is what my directory looks like before I get started. Next cd into the qemu-0.9.0-windows directory. First we need to make two hard disk images. For whatever reason Netware doesn’t detect the MS-DOS disk partition geometry correctly and will destroy your boot hard disk. Since we are running under an emulator, virtual hardware is cheap, so adding a second disk is really no big deal. The MS=DOS hard disk is only to boot up, so it won’t be big at all. I’m going to create a 32 megabyte boot disk, and a 1 gigabyte Netware disk. You can always add more disks, or go with larger disk. Just be forwarned that my Netware didn’t like the MS-DOS disk’s partitioning. This may be a fault of ISADISK, but then it worked fine on its own disk. Ok now with the disks created it’s time to install MS-DOS. I’m going to assume that you have *some* experence with Qemu, and MS-DOS. I typed in “info block” to show what disk images were mounted where. 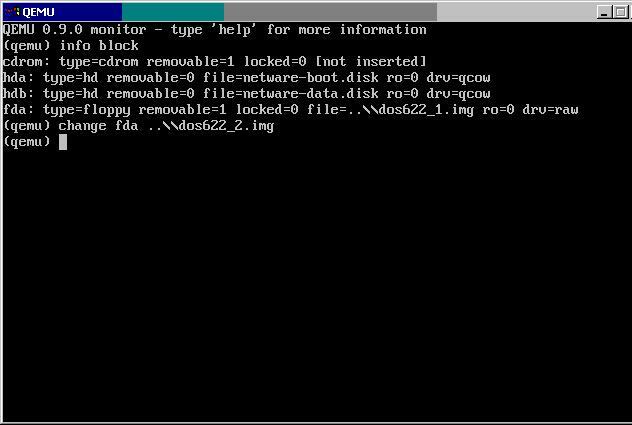 Then to change floppy disk images, simply typing in “change fda ..\dos622_2.img”. Pressing CTRL+ALT+1 changes you back to the qemu display, where you can hit Enter to tell the MS-DOS installation program that you have inserted the second disk image. You will need to repeat this for the third disk. 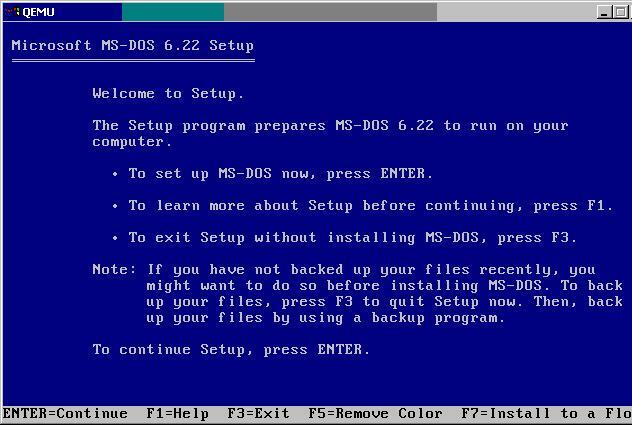 Once MS-DOS is installed it will prompt you to remove disks and press ENTER. You can simply press enter, and qemu will notify you that your disk is not bootable. Close qemu. Now we are going to boot qemu from the hard disk, and with the idecd.vfd disk image containing IDECD.SYS. Copy the IDECD.SYS device driver from the floppy to the C:\DOS directory (copy a:\idecd.sys c:\dos). Then you will need to edit your config.sys & autoexec.bat to recognize the cdrom. 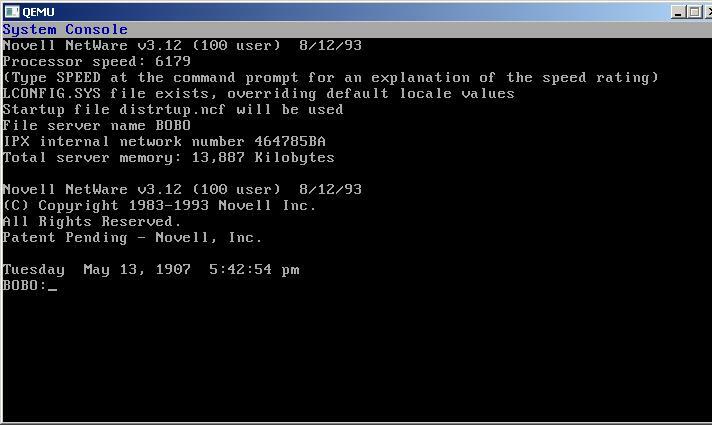 During the MS-DOS install the netware data disk may have been formatted by DOS. This is no big deal, but just keep an eye where your CD-ROM drive is drive letter wise. You’ll get some warning about ethernet frame types, which we can ignore for now. Then you’ll be prompted on the install type. We are going to do a new installation, so just hit enter. The MS-DOS partition will be displayed on the primary disk. We can just leave it alone (or we’ll have to start from the beginning! ), press enter to retain the current setup. Next you’ll be prompted for a server name. I’m not going to cover moving data from an existing Netware 3.12 server, so for now I’m just going to call my server “bobo”. I’m going to accpet the preselected internal IPX number. Again if you are migrating you may wish to preserve the exting information. You will next be prompted as to the location of the DOS mode files. Press enter as the defaults should be correct. You will be presented with the menu driven install. You will want to setup the partition on the ‘data’ disk. press enter twice, then select the second disk. You’ll need to delete any existing partition, then select create a Netware partiton. You can use the defaults (the entire disk). Pressing escape will confirm the partition creation. Press escape to get back to the root menu, now we can create some volumes. I want a 200MB SYS volume, and the rest of the disk as DATA. Of course you may have other wishes, but this is my install. Press insert will allow you to create a new volume. Using 4k blocks, about 50,000 of them will allow for an approximate 200MB volume. Pressing escape & enter will create the volume. Next create the DATA volume with the remainder space. You’ll need to mount the SYS volume by selecting it, and then going down to status, and selecting “Mount Volume”. Then perss enter. Netware will now start to copy the files. This can take a while. Once the copy is completed, press escape back to the main menu, then exit the installer. I know this seems counter intuitive, but its for a good reason. Be sure to select IRQ 2 for the Interrupt Number. Next we will want to select an IPX network number for the card. If you have an existing one, use it, otherwise make one up. Then type in the nework name when prompted. I’m using DEADF00D. Now we can re-load the install program. Go back to System Options, and create the autoexec.ncf file. At the end of this file, you may wish to add “load monitor”. Use the escape & save. Select the default for creating the startup.ncf file. With those two files in place we are now ready! Or even save it to a CMD file. You will now have Netware 3.12 installed on a new computer! I don’t think I need to point out that not only is this exellent for preserving an existing copy of Netware 3.12 (Which was *VERY* expensive in the early 1990’s) But by emulating an older PC we don’t have the same worry when it comes to device drivers. Not to mention the Netware server is now portable to newer computers, by simply copying the data files. I’ll save networking this fileserver for another day. The first professional push into emulation was with Connectix’s Virtual PC for Windows. With the advent of really fast CPU’s (400Mhz+), and cheap ram (512Mb) It was possible to run an entire Windows domain setup on a single PC, that would include a domain controller, fileserver, Exchange Server, IIS Server, Windows Terminal Server, and an OpenBSD firewall. The biggest win in emulation, comes from preserving the cost associated with infastructure. Emulators allow you to preserve your software investments, by allowing you to run your older software, even when the original physical machines & media have long since become unusable. Additionally it’s a great way to get in to big software packages, on the cheap by buying older versions at a massive discount. Besides when it comes down to it, there is nothing wrong with Exchange 5.5, SQL server 6.5, Windows NT 4.0, even VMS 4.5. Who wan’t the constant headaches of upgrading, when you can keep what you already know? Author neozeedPosted on May 13, 2007 Categories welcomeLeave a comment on Welcome!